A passenger who took a crew member hostage and threatened to storm the cockpit on a flight from Dhaka in Bangladesh was carrying a toy gun. The 25-year-old man was shot dead by police after an emergency landing. All 148 passengers and crew on board Birman Airlines flight BG147 disembarked safely after the landing, in the city of Chittagong. Officials later said the man was "psychologically imbalanced" and had wanted to talk to the prime minister. In an operation that lasted about 10 minutes, Bangladeshi special forces stormed the plane and shot the suspected hijacker, who has been named by local law enforcement as aspiring actor Mohammad Palash Ahmed. It was feared that he was carrying explosives on the Dubai-bound flight, and some passengers said they saw him with a firearm. But Chittagong police commissioner Kusum Dewan said in a statement on Monday that the suspect was carrying a toy pistol and had no explosives on him. Wing Commander Sarwar-e-Zaman, the airport manager, told the AFP news agency that Ahmed had wanted to speak to the prime minister of Bangladesh, who was visiting the coastal city of Chittagong, because of problems in his marriage. "The reason he gave for the hijack was that he had troubles with his wife and he wanted to talk to the prime minister, Sheikh Hasina," Mr Zaman said. Investigators are now trying to establish how Ahmed managed to get a toy gun through airport security and onto the plane. 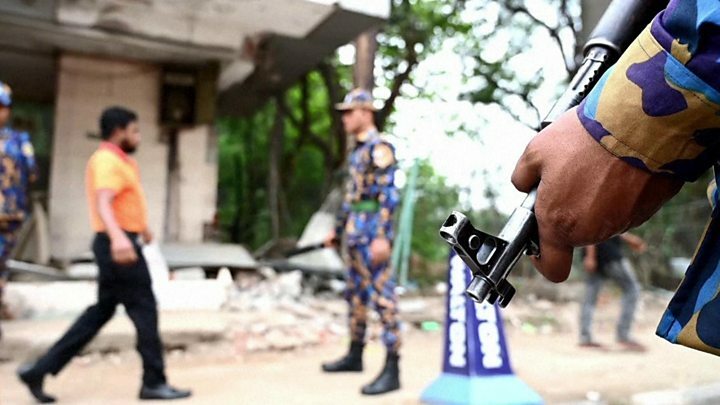 Security measures have been increased at airports in Bangladesh, including at Dhaka's Hazrat Shahjalal International Airport, in the wake of the incident. Army officials said the man was initially wounded in the shooting and later died of his injuries. "We tried to arrest him or get him to surrender but he refused and then we shot him," Maj Gen Motiur Rahman told reporters soon after the incident. "He is a Bangladeshi. We found a pistol from him and nothing else." Staff on board the flight raised concerns after the man was said to have been acting suspiciously and indicating intent to hijack the plane, Reuters news agency reported, citing airline officials. The aircraft was immediately cordoned off when it landed at the Shah Amanat International airport in Chittagong, as officers attempted to talk to the suspect. Images posted on social media showed crowds of people on the tarmac at the airport with the Boeing 737-800 aircraft visible in the background.